What you do now counts. 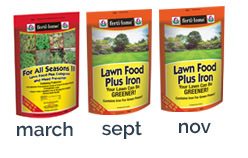 » STEP 1: Ferti•lome® For All Seasons Lawn Food Plus Crabgrass and Weed Preventer w/ Prodiamine pre-emergent herbicide. Apply in early spring 2 to 3 weeks prior to seed germination to control grassy and broadleaf weeds for up to 8 months. For All Seasons contains a light amount of fertilizer to help build healthy roots. » Apply Ferti•lome® Weed-Free Zone to established lawns for post-emergent weed control of over 80 of the toughest-to-control broadleaf weeds including Clover, Ground Ivy, Spurge, Chickweed, Dandelion, Henbit, Oxalis, Poison Ivy, Purslane, Shepherds Purse, Thistle, Virginia Buttonweed, Wild Onion and many others. It’s fast acting and can be applied when temperatures are between 45 to 90 degree range – Spring, Summer, or Fall. Can be applied same day as lawn food. Will not harm existing lawns. 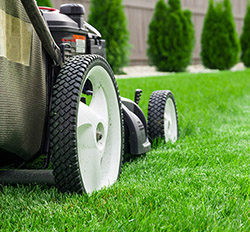 » Apply a good grub killer April – May and/or July – August to drastically reduce population of beetle larvae and the damage they cause to your lawn and landscape beds. Stop in so we can help you decide which product will work best for you!